Including step-by-step instructions to guide quilters of all skill levels, this book includes traditional quilt designs for home decor and accessories; patterns for wall hangings, lap throws, pillows, baby quilts, table runners, valances, and more. I would give this book a two thumbs up. I can see myself making many of these lovely patterns. It is So easy to get addicted to making your own quilts for gifts or personal use. The fabrics these days are gorgeous, the variety of prints, endless. Inside this book are 15 beautiful quilts and 32 one-of-a-kind projects. On page 43 is a blue and cream star quilt that I "have" to make, it even has matching pillowcases patterns. The instructions are easy to follow throughout the whole book, the photos are great. The Twirling Patchwork is a striking quilt--three other options are given, making it look entirely different. There is a special section--Quilters' Schoolhouse---filled with expert advice on rotary cutting, using templates, hand quilting, machine quilting and much more. If you have friends or family who quilt, this book would make a great gift. The colorful quilts and related projects in the photos, will call out to you, "make me". 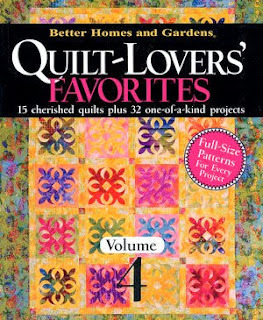 A great book for quilters.